The Imperial Guild of Slavers serves the Eternal Empire of Koth by gathering and managing its slave workforce, assisting in the capture of wanted criminals and recruiting soldiers for the Imperial Legions. The guild has dealings with every other Imperial Guild, the Legions of Koth, all levels of nobility and citizens throughout Koth. Imperial Slavers operate within the Empire and in enemy lands to capture high value slaves and disposable workers. They manage the marking, breaking and policing of slaves and criminals throughout the empire. The Master of the Auction is the appointed leader of the Guild in the territory who oversees the running of slave auctions. 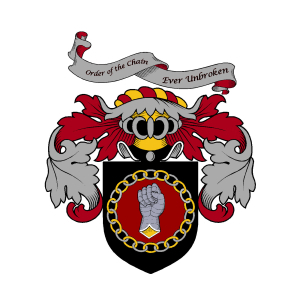 The Master of the Mark is the appointed leader of the Guild in the territory who oversees the marking of all slaves, indentured and permanent, as well as the legal issues and documentation for slaves and slave owners. Applicants who are accepted into the Guild are made an Lash. Lashes who have demonstrated proficiency and loyalty advance to Binder. Binders who show expertise and leadership may be granted the title of Overseer. Overseers who master their craft and display unswerving dedication may be granted the title of Master or Mistress. Applicants who are accepted into the Guild are made an Link. Links who have demonstrated proficiency and loyalty advance to Chain Guard. Chain Guards who show expertise and leadership may be granted the title of Hook. Hooks who master their craft and display unswerving dedication may be granted one of the special titles of Chainmaster or Chainmistress. The owner of a number of Guild owned slaves used for a specific purpose, typically a journeyman. A slaver who specializes in capturing criminals. 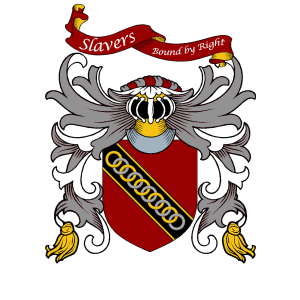 A slaver who specializes in administrating a Hock where slaves are sold. Why join the Imperial Guild of Slavers? You want to help make criminals pay for their crimes by literally making them work it off. You are skilled at nonlethal combat and prefer not to kill your opponents. You are good at sizing people up, determining their skills and what they bring to the auction. You want people to fear your name. You are not afraid to get your hands dirty or bloody. Whispers about the Imperial Guild of Slavers? They use their alchemy and magics to make people what they want, slave or citizen. They constantly forge documents and often just take who they want or will not be missed. They think that everyone has a price and nothing beyond their reach. They have the largest workforce in all the Imperial Guilds and they have people everywhere. Your own slaves could be their spies. The Master of the Guild is a human from Nabban, a swamp filled country in the north of Koth. He carries a nabbanese blade and crossbow. Guildmaster Deavereaux is also a master alchemist, capable of brewing poisons that bring even the wild kentogeni changelings to their knees. In addition, Kenzar is one of the most accomplished hunters in the Guild. 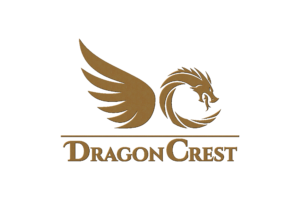 He amassed a fortune capturing changelings in raids upon Kentogen before coming to the Colony of Dupree. Mistress Mara Kithmar is a young rakasha of the tiger clade, descended from the Roar of the Dominion of Pantera. Her family allied with Koth hundreds of years ago, bringing the Empire to Kentogen through the Colony of Felisar. When the Primals gathered and warred against Pantera, the Colony of Felisar was abandoned, though the royal family of the Kithmar was saved by Captain Anton Constantine. When the family was brought to the Empire, they were received as royalty in exile but all save the matriarch have taken to active participation in the business of the returning the Kithmar to their seat of power in Pantera. Mara’s brothers worked closely with Captain Constantine and the Imperial Guild of Slavers, first raiding Kentogen, then travelling to Haelos to work in the Guild there under Guildmaster Deavereaux. Here is where Mara made her name and fortune procuring the most exotic slaves with her alchemy, learned at the feet of Governor Constantine himself and said to pierce the most resistant of creatures which she delivers through claw, food, drink or globe with equal ease. Her preferred targets, like those of her brothers, are the changelings who remain loyal to the Dominions. A paxan bearing the Vexarum of Xentine over his third eye, Master Devel wears the robes of a Xentite blazoned with the chains of the Imperial Guild of Slavers. He is practiced in the art of Ascensi, a form of combat used by the devotees of Xentine using their bodies and minds as weapons. Adu Devel is an accomplished trainer who is rumored to be able to create limited Casted slaves, imprinting skills in his servants. It seems that his technique and power is not nearly as powerful as those of of the Koths themselves who can imprint simple farmers with the skills of elite legionnaires, yet his touch has not created a single remnant. Master Adu Devel travels the colony to inspect and teach both slaves and slavers. He is always accompanied by his retinue to 12 disciples. Slaves trained by the Master himself are said to fetch many times their normal value. The Master of Taming was not allowed in Dupree Proper while Governor Constantine ruled. Now that Constantine has been removed, Master Adu has spent much time in the first city of Haelos.